Ta en 1,5-timers privat tur i Roma sentrum som avslører det beste av Italias hovedstad. Se høydepunkter, inkludert Colosseum og Circo Massimo, og deretter stopp på en kafé i Trastevere. Underveis deler guiden din historien til den fantastiske byen, sammen med tilpassede forslag til flotte steder å besøke på egen hånd. Gjør din egen vei til Colosseum i Roma sentrum for å møte din guide for din tur. Ta en rute som passerer Circo Massimo, og tar deretter en fantastisk utsikt fra Orange Garden. Se Santa Sabina kirke, Tempio di Ercole Vincitore, og Ponte Rotto, og avkjøl din tur på den beste kaféen i Trastevere. 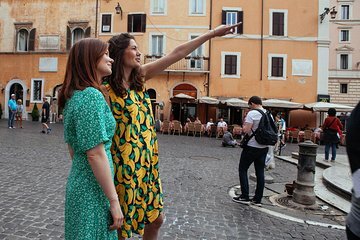 Spør din guide noen spørsmål underveis, og få innsidertips for å få mest mulig ut av ferien i Roma. Din guide kan gi scoop på flotte lokale restauranter, kommende distrikter å besøke, den beste tiden å gå til Colosseum, og Roms historie, mat og kultur. Quick nice overview for our small foursome and one other couple. Super knowledge...good referrals for eateries and bars in addition to the key high points of Rome just to orient us on our first day in Rome. WHAT A GREAT INTRO! Leonardo was amazing, we were late due to a flight delay. We were exhausted too!! Leo was super flexible with us. He whats apped us the day of and made sure we got in ok, we took 2 espressos and went out with him we are so glad we did!! We went to off the tourist path which we enjoyed because we do not like to do the super touristy things. Also we went to a super local italian bar which was super cool. Leo had an amazing personality and his love for art and his city was very admiring. Awesome tour thank you Viator! What a fabulous way to begin our trip to Italy. Our local guide Davide was wonderful. He walked us to many of the historical sites and along the way told us the history of Venice and the many different countries that had help for the city. He took us by the oldes church and told us of a wonderful view to see the top of the city. An amazing 3 hours and I would recommend it for all ages. Valentina was our guide with Who's Local She was awesome and gave us some great tips and the name of a local restaurant that was awesome. It's a great way to learn a little about the city and ask any questions you want to make your stay a little easier. She told us about how to get around and showed us some lovely places that are not on every tour list.